"Thanks for helping me get my life back, Dr. T!" "Great Doctor!! He will do his best to find out what is wrong and fix it!" "Dr. Tassone is an amazing OBGYN. I couldn't have asked for a better doctor." "He took one look at me and knew exactly how to fix me. I trust him completely." "He gave me my health back after a horrible experience with Essure." "Ladies if you can find a way to him DO IT! Thank you for all you did for me!" "I had so much pain and other symptoms from Essure. Thanks for giving me my life back!" "Dr. Tissone balanced my hormones and was the easiest exam doctor I've ever had." "I would recommend anyone to try him and I promise you will walk away happy!" "I drove 3 hours to see Dr. Tassone and he was completely worth every minute of it!!" Your medical needs as a woman change throughout the stages of your life. So having that trusted physician there for you during your pregnancy, and then all the way through menopause, can ensure that you’re getting the care you need. At Tassone Gynecology, you’ll get the expertise of a specially-trained obstetric and gynecologic team. Shawn Tassone, MD, PhD, is committed to caring for patients in Austin, Texas, and surrounding neighborhoods of McNeil, Wells Branch, North Burnet, and Pflugerville. 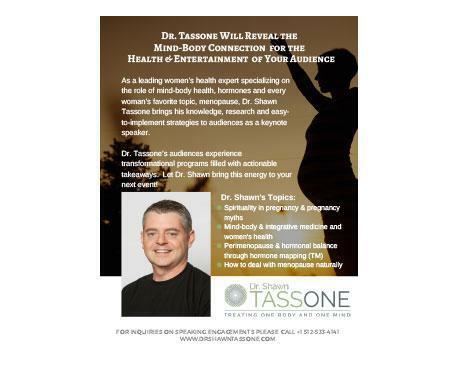 Dr. Tassone is board certified in obstetrics and gynecology, and by the American Board of Integrative Medicine. He holds a medical degree, in addition to a PhD in mind-body medicine. Dr. Tassone is a highly regarded patient advocate. His work includes studies and publications on spirituality in medical care, whole foods to heal the human body, and integrative medicine. Dr. Tassone works as an instructor for medical residents and students at the University of Arizona and the University of Oklahoma Health Sciences Center. He even teaches integrative medicine at Arizona State University. As an integrative health practitioner, Dr. Tassone believes that you should have an active role in your care. He’ll not only treat a certain symptom, but also your body as a whole. This method can help with prevention of chronic illnesses, as well as maintenance, so your body can heal itself. Tassone Gynecology is currently accepting new patients and accepts most major insurance plans. We provide the Acessa™ procedure for symptomatic Uterine Fibroids. If you'd like your community to experience transformational programs and learn actionable takeaways please call us today!